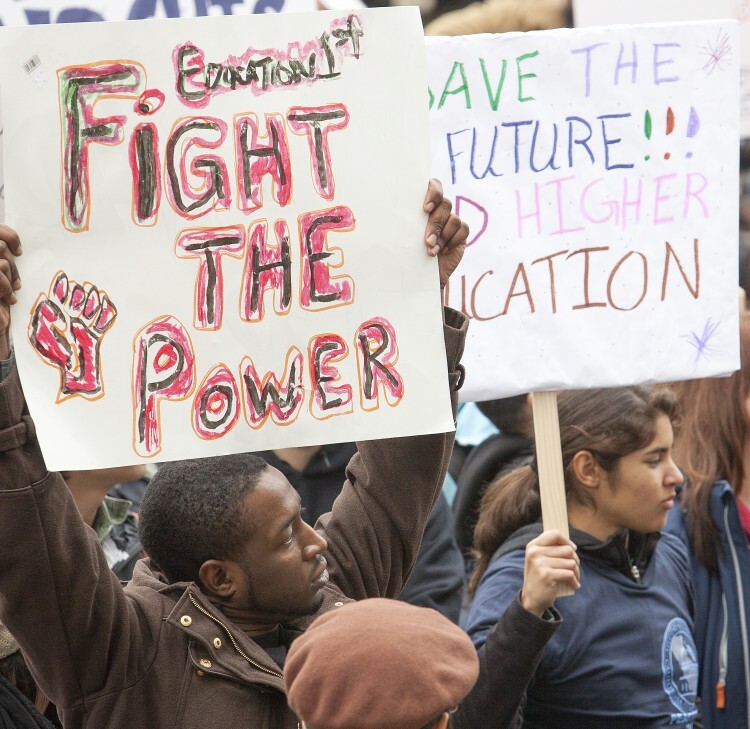 The annual March in March rally for higher education took the message of affordability “from the classroom to the Capitol” on March 3 as City College students joined others from several California community colleges on the south steps, despite the rainy and cold weather conditions. Student Senate President for California Community Colleges Aaron Bielenberg, who is a mathematics major at Mendocino Community College, pointed out that even when it began to rain around 11:30, students continued to show their support. Bielenberg, who explained he arrived at the Capitol just 30 minutes after completing a midterm, said that he understands the sacrifices that everyone made to be there. Bielenberg reiterated a message that most other speakers at the rally had stated—the stigma that those who attend community colleges are less privileged or incapable of attending university-level classes. Though community colleges aren’t currently facing any major budget cuts, according to City College Public Information Officer Amanda Davis, City College’s Student Associated Council said that this year’s march was important to keep student voices heard by local and state government officials. Along with Singh and other SAC members, Paul Kuang, acting president of the Clubs and Events Board, was out in the City College Quad at 8 a.m. to rally students to join the march. Kuang said that one of the major issues is keeping textbooks affordable by providing low-cost or free online access to common textbooks. “[Students] want the textbooks online, but most of the publishers don’t want that because they want the fees from books,” said Kuang. Students from other Los Rios colleges also participated in the march. A student and director of legislative affairs for student government at Cosumnes River College, Malcolm Nash, said that he wanted to be a part of the march to support affordable textbooks, among other reasons. Other speakers who addressed the students at the rally included: Michael Greenberg, SSCCC external affairs senator; Alex Ward, student selected speaker; David Morse, English professor, Long Beach City College and Academic Senate vice president; Martha Penry, California School Employees Association; Sherry Titus, director of the Office of Student Affairs, Palomar College; California Assembly member Rocky Chavez; California Assembly member Paul Fong, and Donovan Hamsher, March in March Committee Chair, SSCCC External Affairs Senator. Angel Jimenez, March in March committee co-chair and the rally’s master of ceremonies, said that despite the fact that community colleges are not currently facing major cuts, it’s still important to address ongoing issues. This entry was posted in News, Sac City Express (SCC) and tagged california, California community colleges, California Community Colleges Aaron Bielenberg, City College, community college students, community college system, community colleges, march, March in March, rally, sac city, Sacramento Capitol. Bookmark the permalink.